We’ve all seen it—the window pane that looks like it’s sweating. As homeowners facing off against windows dripping with condensation, we may not know that the culprit is something we’ve been told is actually good and healthy for us during the dry winter season: humidity! If you have been trying to add back humidity into your home’s indoor air but your windows are now starting to fog up and drip as a result, you are not alone, and there IS a way to fix it. 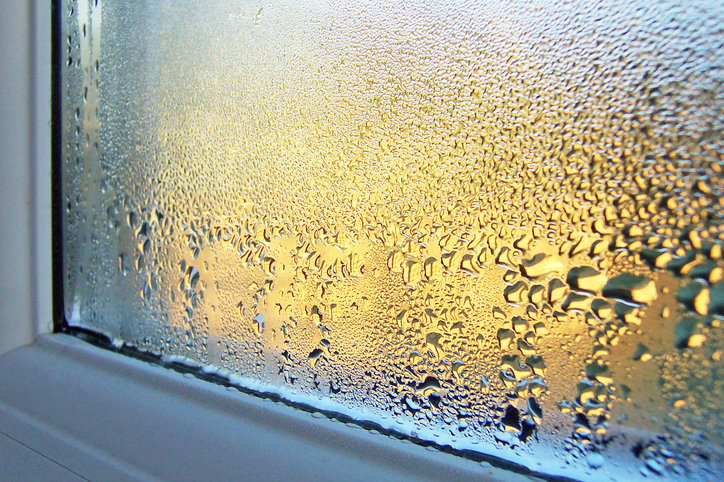 Read on to learn more about what causes window condensation and the best solution for it. Whether your home is a new construction and built to be air-tight or you live in an older home with air leaks galore, the root cause of condensation problems usually boils down to ventilation. Specifically, when there is a lack of ventilation (incoming fresh air to refresh the stale air inside your home) window condensation is frequently the result. So how does condensation occur, specifically? When the warm air inside your home reaches your window panes, it makes contact with the cold air outside via the surface of the window itself. The interaction between these two air sources is what causes window condensation to develop. If you have been following this blog for some time now, you are aware that the ideal humidity level for your indoor air all year long is between 30 and 50 percent. With indoor air that contains more than 50 percent humidity, you risk the growth of mould and mildew and the health issues this brings. With indoor air containing less than 30 percent humidity, you risk respiratory distress and damaged furniture, as well as an increased fire risk. But what if your home is averaging a healthy winter range of 40 to 50 percent humidity and your windows are still condensing? The solution here is twofold: increase the ventilation and decrease the humidity. It probably sounds too simple to be true, but you will know you have reached the right level of indoor humidity and ventilation for your home when your windows no longer fog up and drip with moisture. For some homes—and in particular the newer homes that are constructed to eliminate air leaks—natural ventilation is so rare that it simply isn’t possible to elevate the indoor humidity levels much beyond 30 percent without enduring window condensation as a by-product. So as you back off the humidity level inside your home and increase fresh air ventilation, you will eventually arrive at that point where your air smells fresh and your windows are sweat-free. Of course, when you are playing this type of balancing act between humidity and ventilation, ultimately the biggest loser will be your respiratory health. Thirty percent humidity is at the very low end of what is considered healthy to help your immune system repel germs and allergens. Here, it can often feel like you are in a catch-22 situation. On the one hand, if you increase your indoor humidity, then you say hello to mould and mildew colonies growing around your windows and in between your walls, rotting your wood and drywall day by day and emitting spores that make you and your family sick. Clearly, this is not a good situation! But then again, if you decrease your indoor humidity, the rest of your furniture and furnishings, particularly anything made of wood, can warp and crack, and your respiratory passages will be too dry to be able to fight off allergens and the notorious cold and flu season germs. This is also not a good situation! The Hero That Saves the Day: Ventilation! Ventilation is the key to bolstering your health and reducing or eliminating window condensation in winter. Ventilation can solve a multitude of home problems that otherwise tend to seem un-fixable. Fresh outside air sneaks into your home through leaky weather-stripping, old caulking, and other natural openings around doors, windows, and panels. You manually open doors and/or windows to let the fresh outside air into your home. You install exhaust vents in high humidity rooms (bathroom, kitchen, laundry room, etc.) to release excess humidity outside your home. You install a mechanical ventilation system such as a heat recovery ventilator (HRV) or an energy recovery ventilator (ERV) that ensures ongoing, even ventilation throughout your home. All four of these options can help keep the window condensation issue in check. However, mechanical ventilation (#4) is the only option that doesn’t require you to open your home’s doors and windows in deep winter just to let in some fresh indoor air. Heat/energy recovery ventilation systems are so good at balancing humidity with warmth they can lower your heating bill even as they eliminate window condensation. To learn more and receive a free quote, give us a call at 905-544-2470.